This volume provides a new perspective on the role of culture in shaping the attitudes towards economic development of marginalised people both in the global North and global South. The strength of the collection lies in the examples from within India and without, which illuminate old Dalit-Savarna and Hindu-Muslim dynamics specific to India. These also facilitate a new understanding of the processes of marginalisation in northern capitalist contexts. The essays draw attention to the various modernising forces that have rendered invisible the dynamics of cyclicity, bio-cultural regeneration, and social and ecological reproduction. The volume contrasts Western modernity and modernising processes in India, thereby providing startling new insights on modernity and non-modernity in contemporary India. This enables a deeper understanding of the nature of market forces and their effect on older, non-modern social, cultural, and epistemological dynamics and practices. 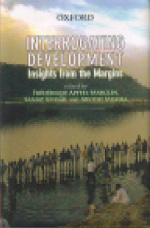 Through specific examples and case studies from India, Europe, and the Americas, this volume explores key issues in the fraught relationship between development and marginalisation. This book will be of considerable interest to students and scholars of social and cultural anthropology, development studies, cultural studies, and subaltern studies, especially in the context of South Asia. Marginalized Communities at the Grassroots Level? Frédérique Apffel- Marglin is Professor Emerita, Department of Anthropology at Smith College, Massachusetts, USA and founder of Sachamama Center, Peru. Arvind Kumar Mishra is Assistant Professor of Social Psychology at Zakir Husain Centre for Educational Studies, School of Social Sciences, Jawaharlal Nehru University, New Delhi.